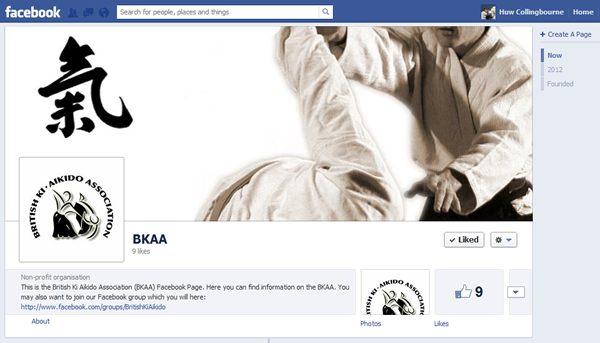 There are now two places where you can keep in touch with the BKAA on Facebook. We have a Facebook page and a Facebook group. The page is public and anyone can add it to their links just by 'liking' it. The group requires that you ask for membership. Once you've been added to the group, you can post or reply to messages and you will be informed when others post or reply. I'd suggest using the page for formal announcements and general information about the BKAA; use the group to interact with other members by posting news, announcements or just chatting together. By the way, you don't need to be a BKAA member to join the group. If you share our interests in Aikido (and you don't even have to be practising "Ki Aikido" - we welcome people from all styles), please feel free to join us.